Shells are generally collected by hand or by using hand-operated shell dredges. The marine snail, or Bailer Shell, produces the melo pearl in response to irritation, but without nacre. 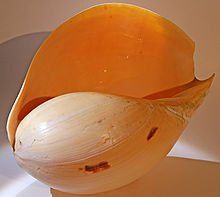 The animal is used for food and the shells are sold for a variety of uses. Boiling ruins the pearls, but since their prices are well known to most fishermen, the animal is searched carefully. The Queensland Marine Specimen Shell Collection Fishery (MSSCF) harvests from a broad range of animals from the phylum Mollusca. These are collected by commercial and recreational fishers for the purpose of display, collection, classification, research or sale (domestically and internationally). Shells are also collected by Indigenous fishers for food, artwork and tools. The fishery area comprises all of Queensland waters within the boundary of the Offshore Constitutional Settlement. Specimen shell molluscs may be alive or dead at the time of collection. Other commercial fisheries (e.g. the East Coast Otter Trawl Fishery) cannot retain specimen shells. 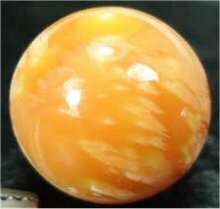 Melos sometimes produce large yellow to orange coloured pearls.